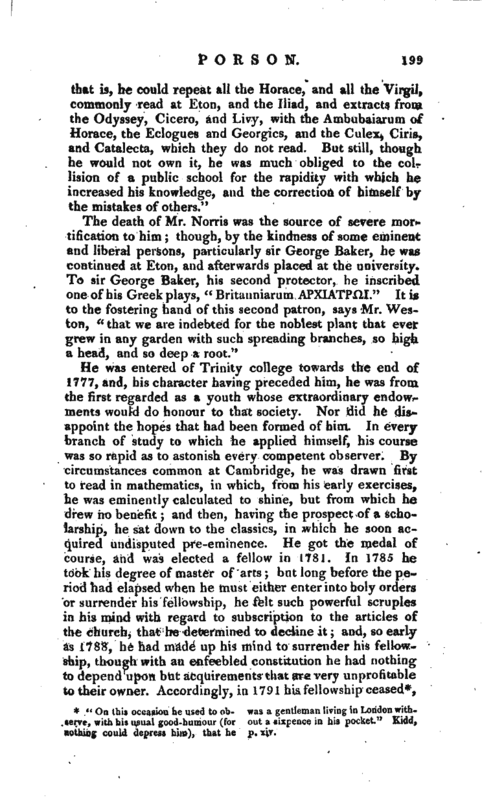 “When he entered Eton, he was wholly ignorant of quantity, and after he had toiled up the arduous path to literary eminence, he was often twitted by his quon Jam schoolfellows with those violations of quantity which are common in first attempts at Latin verse. Our Greek professor always felt sore upon this point. One of his best friends and greatest admirers has preserved a copy of verses, which, indeed, evince the rapid progress of his mind, but would not do honour to his memory.” Kidd’s Imperfect Outline of the Life of R. P. p. xi. From the same we learn, that “the Rev. Dr. Davies, late provost of Eton, when head-master, presented R. P. with a copy of Toup’s Longinus, as a mark of his regard for a good exercise. This book R. P. was wont to say, first biassed his mind to critical researches, and Bentley and Dawes cherisbed and confirmed that strong propensity: the rest he gave himself.” Ibid. * “On this occasion he used to ob- was a gentleman living in London withserve, with his usual good-humour (for out a sixpence in his pocket.” Kidd, nothing- could depress him), that he p. xiv. | but soon after some private friends stept in, and in 1793 he was elected Greek professor of Cambridge, by an unanimous vote of the seven electors. The distinction of this appointment was grateful to him. The salary is but 40l. a-year. It was his earnest wish, however, to have made it an active and efficient office, and it was his determination to give an annual course of lectures in the college, if rooms had been assigned him for the purpose. 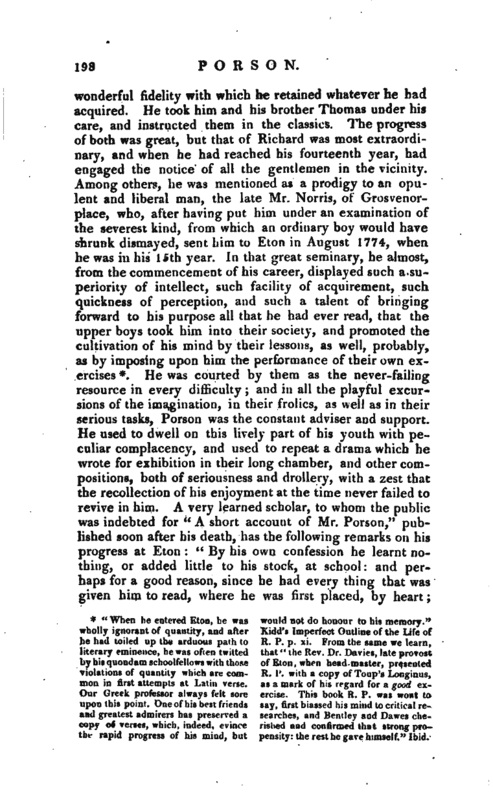 The importance of such lectures as he could have given has been often revolved in the minds of some of his friends, while others have doubted whether his studies, which had been throughout life desultory, could have been concentrated to one point, and that point requiring unremitting assiduity, and a periodical regularity. No opportunity, however, was afforded for the trial. From this time, instead of lectures, it is said he turned his thoughts to publication; but before this, he had been a contributor to some of the literary journals, of articles which displayed his critical acumen. In the 3d vol. 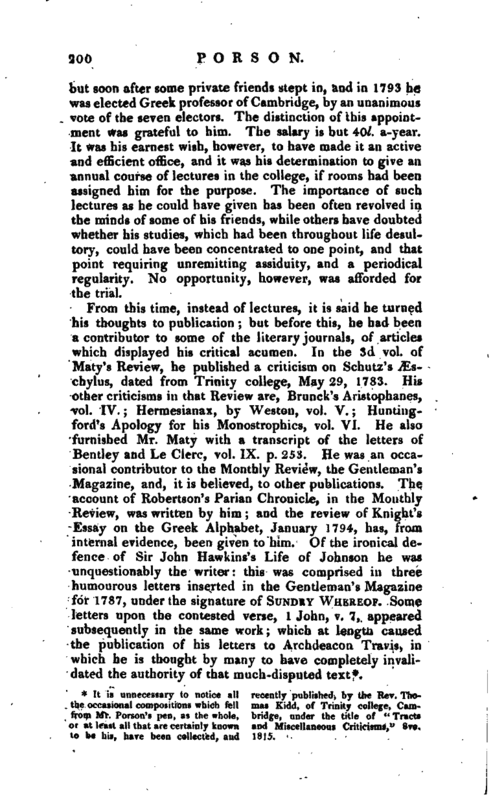 of Maty’s Review, he published a criticism on Schutz’s JEschylus“, dated from Trinity college, May 29, 1783. His other criticisms in that Review are, Brunck’s Aristophanes, vol. IV. Hermesianax, by Weston, vol. V. Huntingford’s Apology for” his Monostrophics, vol. VI. He also furnished Mr. Maty with a transcript of the letters of Bentley and Le Cierc, vol, IX. p. 253. He was an occasional contributor to the Monthly Review, the Gentleman’s Magazine, and, it is believed, to other publications. 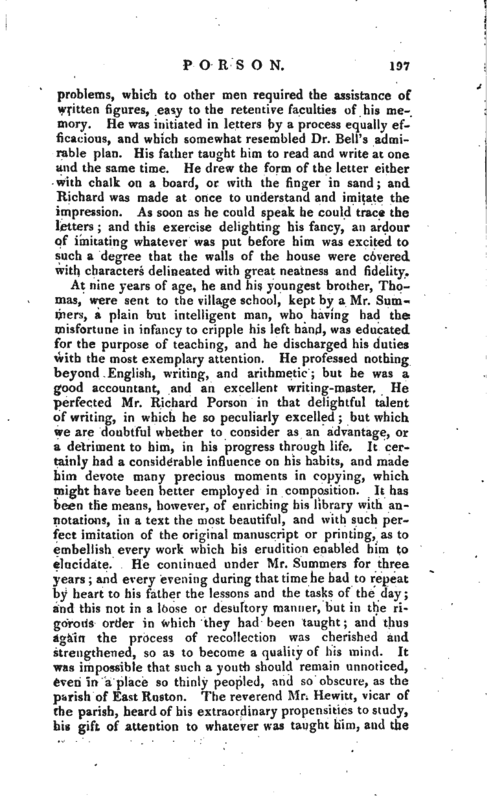 The account of Robertson’s Parian Chronicle, inthe Monthly Review, was written by him; and the review of Knight’s Essay on the Greek Alphabet, January 1. 1794, has, from internal evidence, been given to him. Of the ironical defence of Sir John Hawkinses Life of Johnson he was unquestionably the writer: this was comprised in three humourous letters inserted in the Gentleman’s Magazine for 1787, under the signature of Sundry Whereof. Some letters upon the contested verse, 1 John, v. 7, appeared subsequently in the same work; which at lengtn caused the publication of his letters to Archdeacon Travis, in which he is thought by many to have completely invalidated the authority of that much-disputed text*. It is unnecessary to notice all the occasional compositions which fell from Mr. Person’s pen, as the whole, or at least all that are certainly known to be his, have been collected, and 1815. recently published; by the Rev. Thomas Kidd, of Trinity college, Cambridge, under the title of “Tracts and Miscellaneous Criticisms,” 8vo. | Not long after he had taken his first degree, it was in the contemplation of the syndics of the university press at Cambridge to publish Æschylus, with Stanley’s commentaries, in ms. in the public library of that university. 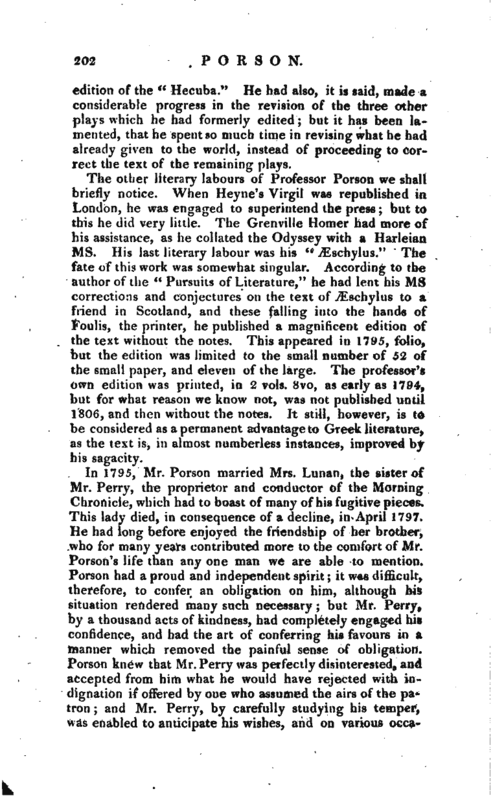 Mr. Porson offered to undertake the work, if allowed to conduct it according to his own ideas of the duty of an editor but this offer was rejected, and in a manner so discouraging, that we are told it in a great measure operated, for a short period, to extinguish in him that ardent love of fame which is, generally speaking, the concomitant of learning and the emanation of genius. We shall find hereafter how much he had at heart the elucidation of this very difficult author, and in the mean time he was not reluctant to employ his pen in similar undertakings. 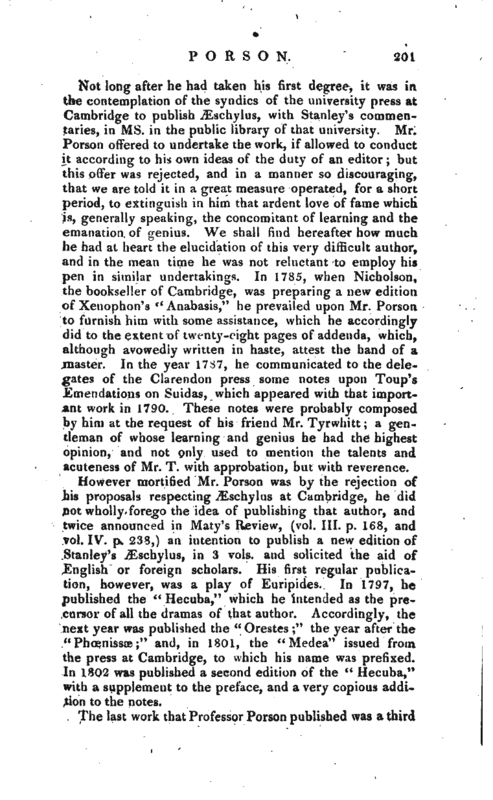 In 1785, when Nicholson, the bookseller of Cambridge, was preparing a new edition of Xenophon’s ft Anabasis," he prevailed upon Mr. Porson to furnish him with some assistance, which he accordingly did to the extent of twenty-eight pages of addenda, which, although avowedly written in hatete, attest the hand of a master. In the year 1787, he communicated to the delegates of the Clarendon press some notes upon Toup’s Emendations on Suidas, which appeared with that important work in 1790. These notes were probably composed by him at the request of his friend Mr. Tyrwhitt; a gentleman of whose learning and genius he had the highest opinion, and not only used to mention the talents and acuteness of Mr. T. with approbation, but with reverence. However mortified Mr. Porson was by the rejection of his proposals respecting Æschylus at Cambridge, he did not wholly forego the idea of publishing that author, and twice announced in Maty’s Review, (vol. III. p. 168, and vol. IV. p. 238,) an intention to publish a new edition of Stanley’s -<Eschylus, in 3 vols. and solicited the aid of English or foreign scholars. His first regular publication, however, was a play of Euripides. In 1797, he published the “Hecuba,” which he intended as the precursor of all the dramas of that author. Accordingly, the next year was published the “Orestes” the year after the “Phcenissae” and, in1801, the “Medea” issued from the press at Cambridge, to which his name was prefixed. In 1802 was published a second edition of the “Hecuba,” with a supplement to the preface, and a very copious addition to the notes. 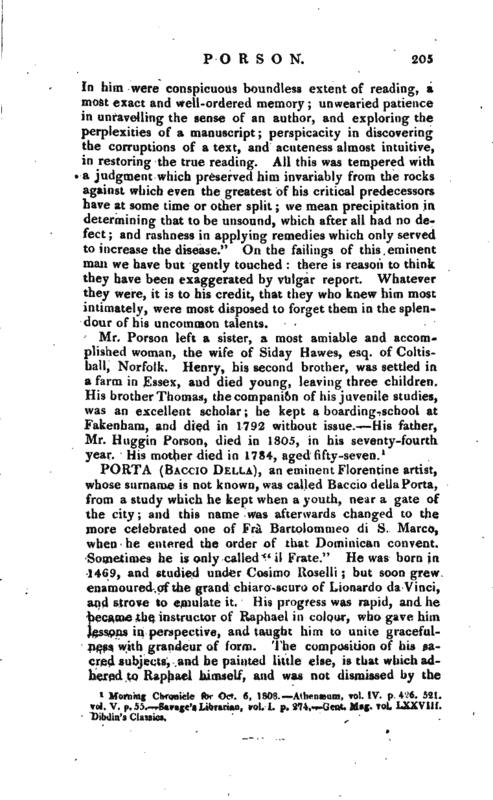 The last work that Professor Porson published was a third | edition of the “Hecuba.” He had also, it is said, made a considerable progress in the revision of the three other plays which he had formerly edited but it has been lamented, that he spent so much time in revising what he had already given to the world, instead of proceeding to correct the text of the remaining plays. The other literary labours of Professor Porson we shall briefly notice. 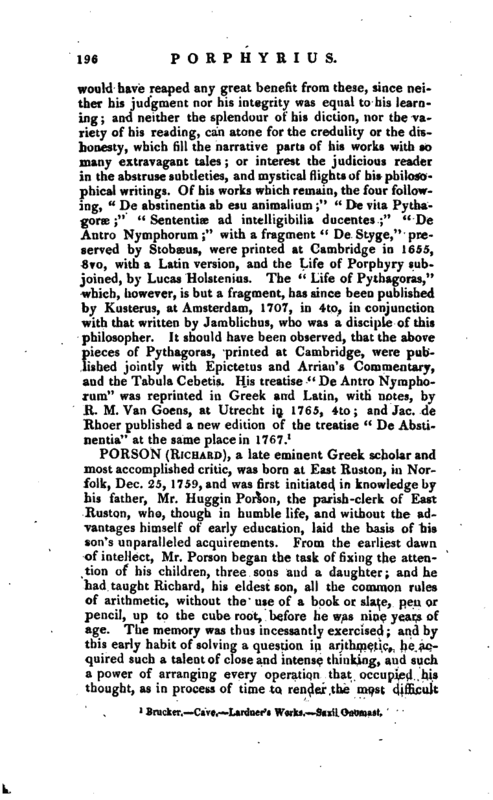 When Heyne’s Virgil was republished in London, he was engaged to superintend the press but to this he did very little. The Grenville Homer had more of his assistance, as he collated the Odyssey with a Harleian ms. His last literary labour was his “Æschylus.” The fate of this work was somewhat singular. According to the author of the “Pursuits of Literature,” he had lent his ms corrections and conjectures on the text of Æschylus to a friend in Scotland, and these falling into the hands of Foulis, the printer, he published a magnificent edition of the text without the notes. This appeared in 1795, folio, but the edition was limited to the small number of 52 of the small paper, and eleven of the large. The professor’s own edition was printed, in 2 vols. 8vo, as early as 1794, but for what reason we know not, was not published until 1806, and then without the notes. It still, however, is to be considered as a permanent advantage to Greek literature, as the text is, in almost numberless instances, improved by his sagacity. In 1795, Mr. Porson married Mrs. Lunan, the sister of Mr. Perry, the proprietor and conductor of the Morning Chronicle, which had to boast of many of his fugitive pieces. This lady died, in consequence of a decline, in April 1797. He had long before enjoyed the friendship of her brother, who for many years contributed more to the comfort of Mr. Person’s life than any one man we are able to mention. Porson had a proud and independent spirit; it was difficult, therefore, to confer an obligation on him, although his situation rendered many such necessary but Mr. Perry, by a thousand acts of kindness, had completely engaged his confidence, and had the art of conferring his favours in a manner which removed the painful sense of obligation. Porson knew that Mr. Perry was perfectly disinterested, and accepted from him what he would have rejected with indignation if offered by one who assumed the airs of the patron; and Mr. Perry, by carefully studying his temper, was enabled to anticipate his wishes, and on various | occasions contrived to exercise a salutary controul over his failings, which his delicacy and judgment rendered imperceptible. Mr. Person was in his latter days often afflicted with a spasmodic asthma, which interrupted his studies, and consequently, in a great degree, repressed his literary ardour. Whether this disease was a revival of a complaint which had afflicted his early youth, or was engendered by the severe and laborious study which had marked his middle age, is uncertain. It was probably increased by the latter, and certainly so by his irregularities, and neglect of the common means of health. There were times, however, when few men could display such patient and continued toil. An instance of this is mentioned which strongly marks his character. He had undertaken to make out and copy the almost obliterated manuscript of the invaluable Lexicon of Photius, which he had borrowed from, the library of Trinity college. And this he had wiith unparalleled difficulty just completed, when the beautiful copy, which had cost him ten months of incessant toil, was burned along with the house of Mr. Perry, at Merton. The original, being an unique entrusted to him by the college, he carried with him wheresoever he went, and he was fortunately absent from Merton on the morning of the fire. Unruffled by the loss, he sat down without a murmur, and made a second copy as beautiful as the first, which is now in Trinity-college library. When the London Institution was established, professor Porson was selected to fill the situation of principal librarian. This office, which was rewarded with a salary of 200l. a year, and a suite of rooms, provided very amply for a man in whose eyes money had little value, unless as it enabled him to pursue his studies but it was rather convenient in that view, than gratifying with respect to its duties. 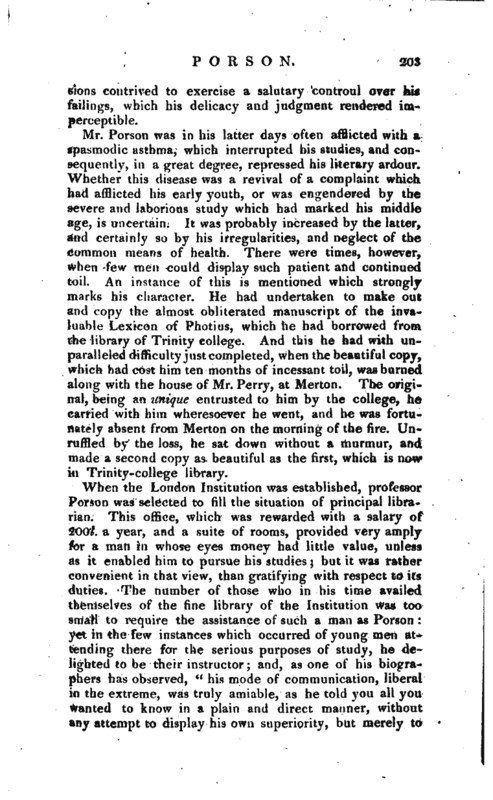 The number of those who in his time availed themselves of the fine library of the Institution was too small to require the assistance of such a man as Porson yet in the few instances which occurred of young men attending there for the serious purposes of study, he delighted to be their instructor; and, as one of his biographers has observed, “his mode of communication, liberal in the extreme, was truly amiable, as he told you all you wanted to know in a plain and direct manner, without any attempt to display his own superiority, but merely to | inform you.” We have often been surprized that the business of tuition was never recommended to him but perhaps in this, as in other instances, the irregularity of his habits would have been a great obstruction. In the year 1808, his asthmatic complaint became so frequent as to interrupt his usual pursuits, and so painful that during the agony he never went to bed, and was forced to abstain from all sustenance. This greatly debilitated his body and about a month before his death he was also afflicted with an intermittent fever. 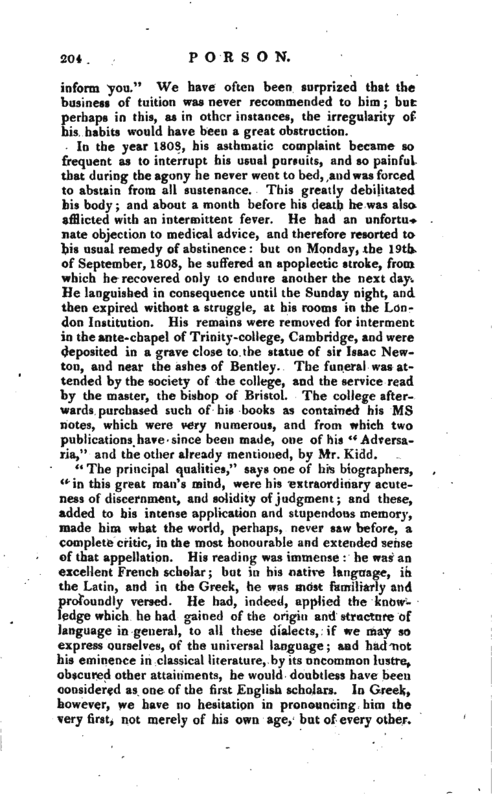 He had an unfortunate objection to medical advice, and therefore resorted to his usual remedy of abstinence but on Monday, the 19th of September, 1808, he suffered an apoplectic stroke, from which he recovered only to endure another the next day. He languished in consequence until the Sunday night, and then expired without a struggle, at his rooms in the London Institution. His remains were removed for interment in the ante-chapel of Trinity-college, Cambridge, and were deposited in a grave close to the statue of sir Isaac Newton, and near the ashes of Bentley. The funeral was attended by the society of the college, and the service read by the master, the bishop of Bristol. The college afterwards purchased such of his books as contained his ms notes, which were very numerous, and from which two publications have since been made, one of his “Adversaria,” and the other already mentioned, by Mr. Kidd. “The principal qualities,” says one of his biographers, * c in this great man’s mind, were his extraordinary acuteness of discernment, and solidity of judgment; and these, added to his intense application and stupendous memory, made him what the world, perhaps, never saw before, a complete critic, in the most honourable and extended sense of that appellation. His reading was immense: he was an excellent French scholar; but in his native language, in the Latin, and in the Greek, he was most familiarly and profoundly versed. He had, indeed, applied the knowledge which he had gained of the origin and structure of language in general, to all these dialects, if we may so express ourselves, of the universal language; and had not his eminence in classical literature, by its uncommon lustre, obscured other attainments, he would doubtless have been considered as one of the first English scholars. In Greek, however, we have no hesitation in pronouncing him the very first, not merely of his own age, but of every other. | In him were conspicuous boundless extent of reading, a most exact and well-ordered memory unwearied patience in unravelling the sense of an author, and exploring the perplexities of a manuscript; perspicacity in discovering the corruptions of a text, and acuteness almost intuitive, in restoring the true reading. All this was tempered with a judgment which preserved him invariably from the rocks against which even the greatest of his critical predecessors have at some time or other split we mean precipitation in determining that to be unsound, which after all had no defect and rashness in applying remedies which only served to increase the disease." On the failings of this eminent man we have but gently touched: there is reason to think they have been exaggerated by vulgar report. Whatever they were, it is to his credit, that they who knew him most intimately, were most disposed to forget them in the splendour of his uncommon talents.